"The Phone Message" is the ninth episode of Seinfeld, and the fourth for the show's second season. It originally aired on February 13, 1991. George is concerned when his girlfriend doesn't return his calls. He begins leaving increasingly angry — becoming almost hostile — messages on her answering machine. Later, he discovers that she was out of town at the time and unable to check her messages. 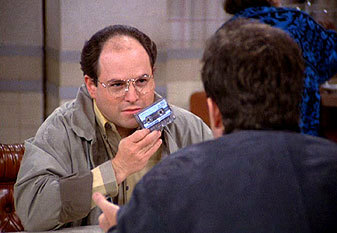 Before she can hear the messages (which would surely lead to a breakup), George and Jerry create a plan to get into her apartment and switch the tape. The plan (barely) succeeds, just in time for George to learn that she already heard the messages and found them funny, adding that she "loves jokes like that." Meanwhile, Jerry dates a woman who likes a cotton Dockers commercial he absolutely hates.